Baby Magic has been comforting babies skin since the 1950's. Probably any Mom can tell you she knows of this brand. I knew this brand even before I had kids. It's a diaper bag staple for sure. You'll find in on changing tables, nursery rooms, and even on Mom's bathroom counter. It's perfect for a baby's skin, but can be used by adults for soothing and softening skin too. Baby Showers would not be complete without Baby Magic Brand given as a gift. From baby wash to diaper treatments, there is an entire line of products just for your baby's cleaning and skin care. You can find Baby Magic in most any store's baby aisle. Look for their ready made gift baskets for your next shower or baby gift need. Or choose a selection of Baby Magic Products and make up your own personalized gift basket. New moms and dads will appreciate the tried and true brand of Baby Magic, Grandparents will remember the scent of Baby Magic- just like they used on their own baby- which would be you! Keep a bottle at Grandma's house for your visits there and keep one on the changing table for after diaper change soothing and comforting. Baby Magicin Sweet Baby Rose scent is hypoallergenic and softens skin. It absorbs quickly, smells great-what else do we need to know?! I used it on my babies, and it's a brand you can trust and use at any age. Baby Magic is made in the USA. They don't use quaternium-15 as an ingredient in any of their products. I don't really know what that is, but know it doesn't sound like something to apply to a babies skin. They don't use 1,4 dioxane in their manufacturing process-again another word I am not familiar with-and don't think I want to know! And it's Paraben Free- this is good, and I do know this one! It's also DMDM Free. I am going to look that one up. 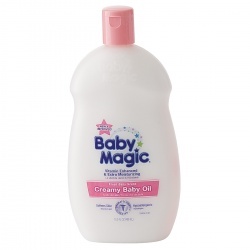 Giveaway: Baby Magic wants to give one reader a bottle creamy baby oil. Leave a comment on this post telling me who you would use Baby Magic for. Please leave your email in the comment so I can contact you if your comment is chosen by random.org. Giveaway closes October 16, 2012 at 12 midnight EST. Open to residents of USA for shipping reasons. I have a 10 month old baby boy I would use this for. Thanks you! I remember my mom using Baby Magic with my younger brother! The lotion always smelled so good! I have a 17 month old who I would loe to use it for! I remember this stuff from when I was younger, but don't use it on my littles. Glad to hear they don't have some of the bad junk in it though! Mine are getting too big for baby products :( ALthough happy they are healthy, they are growing so fast! I would use this on my son, he has very dry skin. And probably on myself too! Ooh sweet Baby Rose sounds like it would smell wonderful. Thanks for sharing your experience with their products. Great giveaway! If I won, I'd use this as a gift for a friend who is expecting, include it as part of a fun bathtime gift basket.